What Day Of The Week Is November 4? 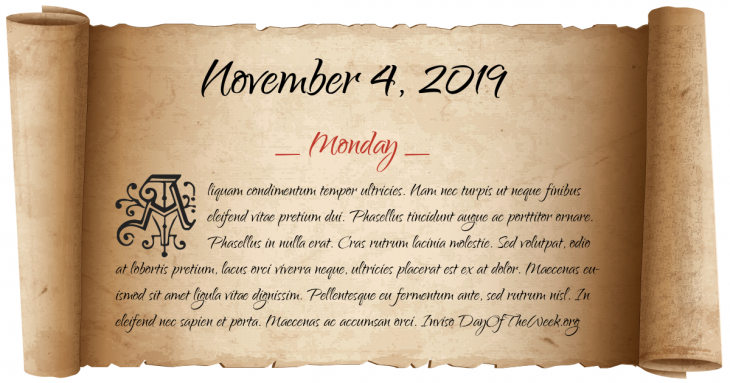 November 4, 2019 is the 308th day of the year 2019 in the Gregorian calendar. There are 57 days remaining until the end of the year. The day of the week is Monday. Eighty Years’ War: In Flanders, Spain captures Antwerp (after three days the city is nearly destroyed). City & South London Railway: London’s first deep-level tube railway opens between King William Street and Stockwell. World War I: Austria-Hungary surrenders to Italy. Nellie Tayloe Ross of Wyoming is elected the first female governor in the United States. In a test of the Nike-Hercules air defense missile, Shot Dominic-Tightrope is successfully detonated 69,000 feet above Johnston Island. It would also be the last atmospheric nuclear test conducted by the United States. The Netherlands experiences the first Car Free Sunday caused by the 1973 oil crisis. Highways are deserted and are used only by cyclists and roller skaters. Proposition 8 passes in California, revoking state recognition of LGBT marriages. Who were born on November 4?